Capacity up to 600-1,600 lbs. Large top plate and raceways combine ease of swiveling and strength. 3/4" nut and bolt king pin. 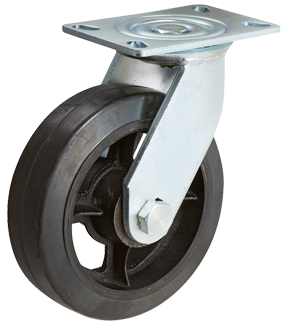 Zerk fittings in wheel and swivel bearings. Legs welded by machine for uniform consistency and strength. 3" fork spacing (Leg thickness: 23/64"). 3/4" diameter axle and lock nut.